Teleportation has never looked so fun. There is more to HoloLens (and augmented reality in general) than catching Pokémon. What more, you ask? Bringing games like Portal to life, for one. AR developer Kenny W has fiddled with both. He has nearly half a dozen videos on YouTube showing off AR situations based on Pokémon, which seems to be a popular subject in AR (and made a few waves with a little game called Pokémon Go last year). However, Kenny's newest video gives us a glimpse of what playing Portal on HoloLens could be like, and it's pretty rad. "The project itself was developed in the Unity 3D engine, which is fully supported by the HoloLens," Kenny told The Next Web. Portal is a fun game in its own right, and also challenging. But playing it in a real-world setting adds a new level of immersion. Using a virtual Portal Gun, Kenny creates blue and orange portals in a variety of real-life locations, including his kitchen. The Companion Cube interacts with the surrounding objects and barriers contained in them. For example, in one scene the Companion Cube teleports out of the wall and lands on Kenny's kitchen table. The interaction here is key to the immersive experience. In another scene, the Companion Cube rolls down a flight of stairs semi-realistically. It could use some polishing, but for what Kenny describes as a "fun side project," he did a great job creating what is one of the coolest mixed reality demos to date. Unfortunately, our experience with HoloLens didn't match up with how cool it looks on video. The augmented reality technology is impressive, but its small field of view means only a small portion of the world around you, directly in your center of vision, is augmented, which doesn't come across in video demos like the one above. Give us a second-gen HoloLens with full-field augmented vision, though, and we might never stop playing Portal in AR. 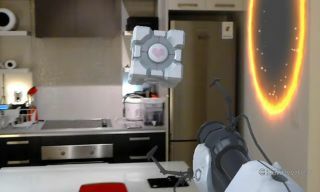 While there are no official plans to bring Portal to life using AR, Valve co-founder and CEO Gabe Newell has gone on record saying that Valve is working on VR games of its own.